Here at Restorative Bodywork, we make a conscious effort to use sustainable and eco-friendly products whenever possible. This helps to reduce our impact/footprint within the York PA community and the world at large. Although there a lot of facts to consider, it is clear that we as a species have a profound impact on the environment around us. In this article, we have listed all the ways we try to reduce our footprint and utilize organic products. For your convenience, we have a link to each of the products used when possible so you too can verify the products source and quality. Massage oil is an essential part of our operation. Choosing the proper oil to use during a massage can make the difference between a good massage & a great one. 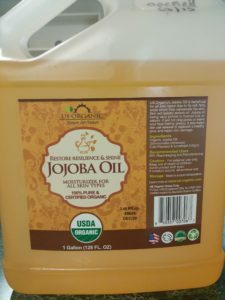 We choose to utilize 100% Pure Certified USDA Organic – Jojoba Oil. 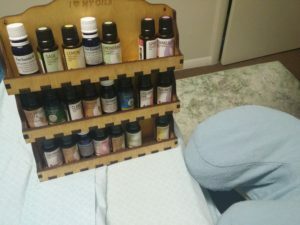 When it comes to essential oils there are some key factors to look for when looking for quality. Lucky for you we have done the research…lots and lots of research. For all our essential oils we choose to use either Rocky Mountain Oils or Natures Gift Oils. Based out of Utah & Tennessee these companies hold their products to a higher standard. All ingredients are sustainably sourced and rigorously tested for quality. Both companies have organic lines and offer full transparency when it comes to the quality of their products. We are proud to support these two US-based companies. To add on essential oils to any service or to experience our renowned sinus treatment, click here to view our full service list. Toilet paper, paper towels, and tissues are some of the most common forms of waste within the office. That is why we found it essential to ensure these products were made from 100% recycled materials. Currently, our printer uses 30% recycled paper, though we do have 100% recycled slated for our next order! We would need a mighty big soapbox to stand on to get into all the things that are wrong with the bottled water industry. 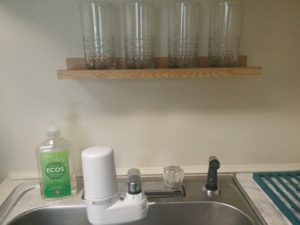 So, for now, we are going to keep it simple and just let it be known that we use a simple Brita sink filter and glass drinking cups for our guest’s water. By doing so, we reduce the amount of plastic that is put back into the landfills each year. We also reduce the carbon footprint created by the production and transportation of bottled water. It takes 1 PET plastic bottle 700 years to start decomposing. Bacteria, which usually helps in breaking down organic materials, don’t like petroleum-based plastics. Technically, they can last forever. 90% of the cost of bottled water is due to the packaging, not the water quality. This is one we like so much we use it in our own home. To wash all the sheets and towels for our facility, we use My Green Fills. They are a US-based company that offers a non-toxic option to laundry detergent. Not only is the detergent fragrance-free, it features none of the harmful chemicals you’ll find in Tide and other similar products. We also love them because they allow you to reuse your jug. They ship your refills monthly to keep it nice and easy. No plastic waste, no toxic chemicals, and clean sheets. We can dig that. 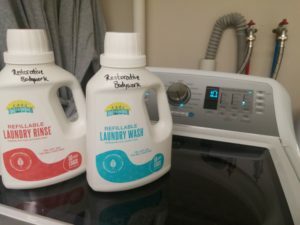 For more information on the science behind it all and some startling facts about laundry detergent check out their website here. Both units are energy star rated and the washing machine is also a high-efficiency unit. This allows us to reduce the energy consumption of each machine and keep their footprint as small as possible. 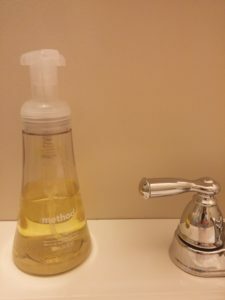 We rotate hand soaps from time to time but for the most part, you’ll will find either Method or Ecos. Both are wonderful products that feature plant-based solutions that are hypoallergenic. Method does a really nice job of listing all the ingredients and what they do and where they were sourced from. From the lamps to the infrared sauna, you’ll find LED bulbs throughout the office. These lights use a fraction of the energy a traditional bulb will use. The crazy part, they last for years and years and years. So while they may be a touch more expensive, they are well worth the long-term energy savings. True story, we once found 80w bulb and we were able to find a matching LED bulb that was only 10w. That’s a 70w energy saving! Now imagine doing that over your entire house or office, that’s some savings! Tazo is a sustainably sourced brand of tea that is an office go-to. They have strong flavors and a quality product that makes a good cup of tea every time. One thing we always try to do is to consolidate orders or buy in bulk when possible. This helps to cut down on the number of deliveries needed. By doing this we cut down on packaging wasted and carbon burnt to make the delivery. Fun fact, when checking out on Amazon you can select to have your items boxed together to help save packaging! 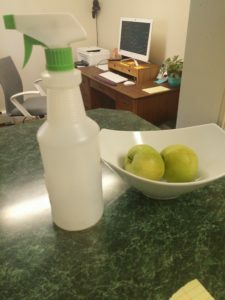 We make our own in-house disinfectant. As you may or may not have been able to tell, we’re not big fans of unnecessary chemicals. So we mix up a batch of the recipe below in a spray bottle to create a 100% natural disinfectant that won’t leave behind a toxic smell. In an effort to reduce paper waste we use digital intake forms and email or text receipts. By doing so, we help reduce the trees being cut down! A simple way you can reduce paper waste at home is to sign up for online billing for all your monthly bills! No more stacks of bills that will just end up in the trash. If we all do our part and change what we can, when we can, we have a chance to shift the general momentum & mindset of our culture in a more sustainable direction. If you have any tips or ideas for us on how we can better our sustainability efforts, we would love to hear them!